One of the best Small SUV’s of 2018 just got better in 2019. The all-new 2019 Toyota C-HR for sale in Ontario offers three new trim levels, a head-turning stylish design, sportier handling, more space than most vehicles its size, added technology and more comfort than ever before. Instead of being limited to XLE and XLE Premium models like last year, the newest Toyota Coupe, High Riding SUV is now available in LE, XLE, and Limited trims. · LE – Available with 17-inch steel wheels and a urethane steering wheel, this C-HR trim level also offers a leather-trimmed and satin-plated shift lever. Standard equipment also extends to keyless entry, dual zone climate control, heated mirrors, an 8.0-inch touchscreen has Apple CarPlay compatibility, while the stereo is a six-speaker Entune audio system. On the outside, the LE has color-keyed bumpers, door handles, a rear spoiler, and outside mirrors. · XLE – This model brings with it minor upgrades over the LE including 18-inch alloy wheels, color-keyed touch-sensor door handles, heated power outside mirrors with blind-spot monitoring indicators and puddle lights, push-button start and a leather-trimmed steering wheel. The remote keyless entry system is also upgraded to provide illuminated entry. 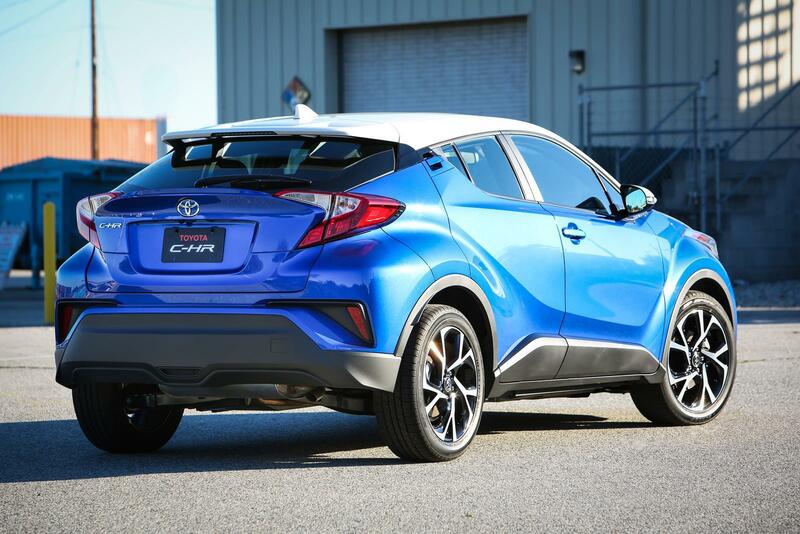 · Limited – This is the only C-HR model with rain-sensing wipers and LED fog lights, while Verizon-powered Wi-Fi supports the Toyota Connected Services functions. Heated leather-trimmed bucket seats for the driver and front passenger join leather trim for rear passengers. On the outside, a red rear bumper garnish, chrome window trim accent, and black B-pillar garnish are also standard. 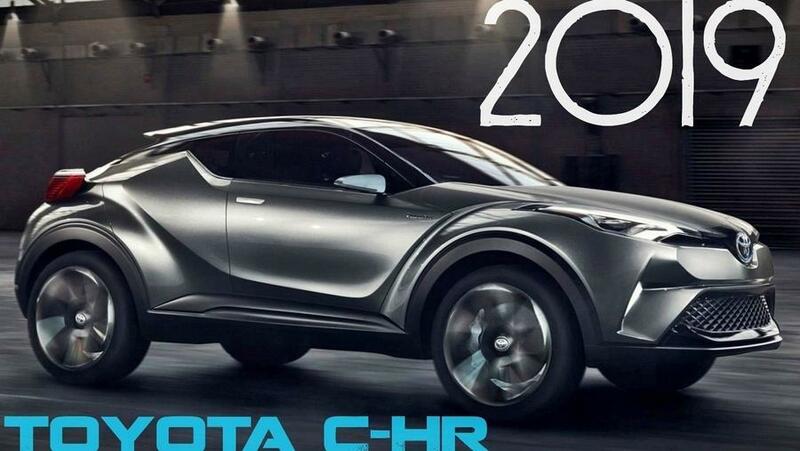 Designed to replace the now non-existent Toyota Scion, the more futuristic Toyota C-HR compact Crossover SUV is all about the looks. With funky intersecting and stylish shapes that offer curves, kickbacks, and curls all rolled into one. This vehicle’s headlights wrap tightly into the wheel wells, and the deep side stampings press into the skeletal shape. The busy rear end sticks out—literally and figuratively—with bracketed taillights that are equally expressive as the rest of the car. Powered by a 2.0-liter gas engine with front-wheel drive, Toyota’s continuously variable transmission (CVT), C-HR front struts with Sachs dampers, a beefy front stabilizer bar, and an independent rear suspension with double wishbones the all-new Toyota C-HR offers sportier handling than ever before. With 19.0 cubic feet of cargo space behind the second row and 36.4 cubic feet with the second row folded, the 2019 Toyota C-HR offers more space than most in its class like its sister vehicle, the Toyota Corolla. This new compact crossover also has several new technology upgrades in 2019. One of these major improvements involves the inclusion of Apple CarPlay, which allows your Toyota to be more compatible with Apple devices. This new Toyota will also have the upgraded Entune 3.0 infotainment system that comes equipped with apps that you can access handsfree or through the included touchscreen display. After this description, why wouldn’t you want to drive the most futuristic and sporty Toyota sedan in the Hometown Toyota lineup? Get to your Toyota dealer in Ontario today for a test drive of the future.